Peek’s Pike was designed to be fast and easy for a beginner to build, at moderate cost and using minimum space. It illustrates most of the advantages of micro layouts … and offers some new ideas as well. Let’s start by taking a look at the track plan. This plan may look a little odd to you. Parts of the trackage seem unconnected from the rest; there’s a fuzzy grey area at the right called “Fiddle”; and the whole thing doesn’t look very much like a railroad! Let’s look closer. First, There are three industries listed on the plan — a brewery, a cooperage, and an electrical goods dealer. A scrap dealer looks like he’s in the future plans as well. The time setting for this little road is 1934, the place is a generic American town near where you grew up. Prohibition has just recently been repealed, and the brewery business is booming. So is the cooperage business, which supplies the barrels for the beer! The main job of this little narrow-gauge railroad is to transport barrels from the cooperage to the brewery, and then haul the beer away to the offstage interchange with the Big Railroad. Peek’s PIke was about to go under in the Depression, when the repeal of Prohibition — and the road’s fortunate location connecting cooperage, brewery, and Big RR interchange — saved the day. In fact, a nearby electrical goods dealer also asked the PPRR to bring him supplies and haul away his products, which was a bonus that put the road solidly in the black. Notice that there are no curved tracks on this road. All track is straight — which makes it very easy for a beginner to lay the rails accurately. And coupling or uncoupling will be simpler and more consistent. WHAT’S THE ‘FIDDLE’ ALL ABOUT? “Fiddle” or “Fiddle Yard” is a British term for the hidden part of a layout where cars and locos are “fiddled” by hand to make up new trains and get ready to reenter the visible part of the layout. It’s the “secret weapon” that makes micro’s such good operating layouts. In effect, it represents the “rest of the world”, the offstage part of the line that we can’t see. So let’s get to work. First thing to do is to make the baseboard. The baseboard is foamcore board from an arts supply store. Foamcore is a very lightweight art board that has foam in the middle sandwiched between two layers of heavy paper. It’s surprisingly sturdy and even nearly waterproof! 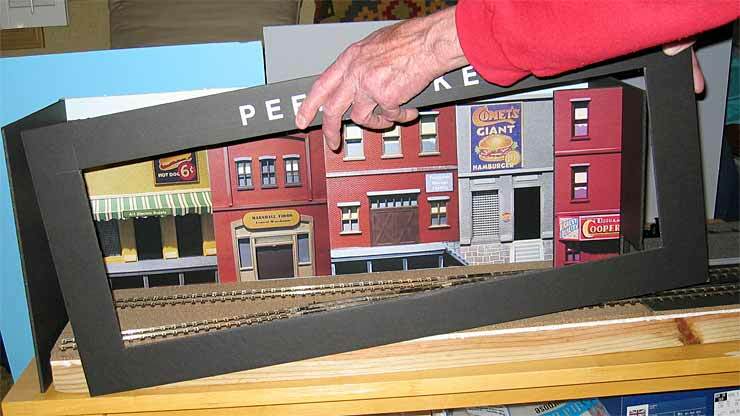 One 30×40 inch board of 3/16″ foamcore will take care of your needs for Peek’s Pike. However, you may want to get fancy, as I did, and make your staging — the front stage opening and wings — from a sheet of black foamcore, which looks quite elegant. A 20×30 inch sheet will do. As I built it, Peek’s Pike is one meter long and 21 cm wide. In U.S. units, it’s 39 inches by 8-1/4 inches. 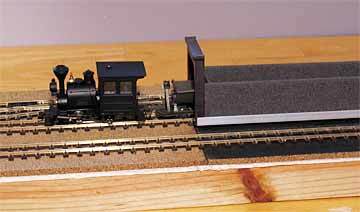 You may want to adjust these dimensions to fit your space, and perhaps to hold a little more track for extra switching opportunities. By all means, do so … just make sure you make those adjustments before you start cutting the foamcore! To glue, lay the baseboard, bottom up, on the table. It’s a good idea to put some old newspapers underneath, especially if you’re using the good dining room table to glue on! 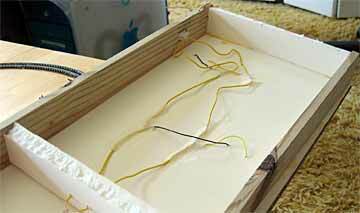 Use a hot-glue gun to assemble the baseboard. (What? You don’t have a hot-glue gun? Get one immediately at any nearby discount store. They’re useful for hundreds of household repairs, and are so widely used that I’m not even going to count the cost in our layout tabulation!) Start with one 39-inch side rail. Hold it in place, standing upright on edge from the baseboard. Run a bead of glue along the joint between rail and baseboard. Hold for a count of three. Okay, that’s in place — solidly and long-lastingly! Next mount a cross-rail on the end of the baseboard, joining the side rail at a right angle. Again, run a glue bead along the joint line. Do the same with the second 39-inch side rail and the opposite end’s cross rail. Put the other two cross rails between the side rails, 10 inches from each end. They provide extra bracing for the top, so it won’t ever sag. And that’s it. Your baseboard is complete. It will look something like this. Should take about 1/2 hour to build. All track is Peco On trackage… three 3-foot lengths of flex track and one each of left and right turnouts. As all tracks are straight, putting them down is just a matter of cutting the flex track to length (with a razor saw or track nippers), attaching the lengths to the turnouts using rail joiners, and gluing down the whole thing. Before you start gluing, be sure to check the next section about the two insulating rail joiners that are needed between the two turnouts! Use Elmer’s white glue (or equivalent). You can ‘t really use hot glue, because you’ll need some “wiggle time” to make sure the track is aligned properly before you leave it in place for good. Follow the plan for dimensions, it’s drawn to scale. The Fiddle Yard is 12 inches long, same as the Loco Lift that will operate in it. The first turnout is exactly 5/8″ from the end of the Fiddle Yard. You may want to paint the Fiddle Yard black, as I did, just to make clear that it’s “offstage”. This step isn’t really necessary, however. You need to arrange for electrical feeds at three places on this layout. You’ll need to attach a wire to each rail at three places to wire the PPRR. If you already have soldering skills, this is a simple chore. Just tack a wire to the base of each rail and feed it through a tiny hole you’ll punch in the baseboard (I use an awl or an icepick for this task). If you haven’t yet tried soldering, there are several other ways to attach wires to the track.Talk to your local hobby shop or call a shop like Caboose Hobbies. 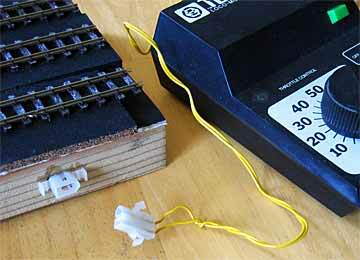 Several manufacturers make clips that will hold wires onto the rail. 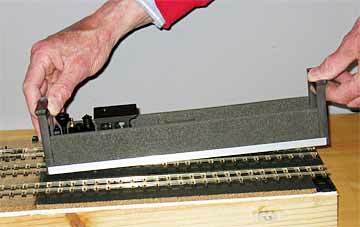 Also available are wires pre-soldered to rail joiners, that you can just pop onto the ends of the track, feeding the wires to the bottom of the layout. The bottom of Peek’s Pike looks like this (left). Run the feeders from the rails to the appropriate bus, making very sure the same rails always are attached to the same bus! You can solder these connections, or just wrap the wires around the bus and tape them down. The ends of the bus feed into a socket of your choice (at right). The connectors shown are standard Radio Shack parts [Connector Cost: $2]. Wires can be attached to the connectors by crimping, not requiring soldering (although it helps one’s piece of mind to have them securely soldered!). The female socket is attached to the “Variable DC” terminals of your power pack. You can use virtually any power pack you already have — the excellent Bachmann locomotives we’ll use for this On30 road require very little current to glide smoothly along at slow, switching speeds. So. 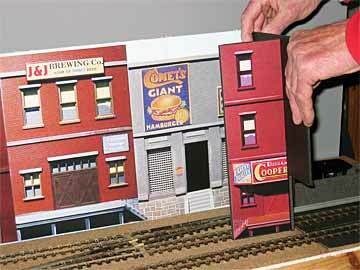 Plug in your power pack, put a train on the track (or into the Loco Lift), and run a railroad! When you have some time left over from railroading, and would like to explore more additions to Peek’s Pike, have a try at making some scenery. No two people will ever make the same scene, even on the same track plan … but because I designed the scenery for my pike using a couple ideas that may be new to you, I’ll tell you what I did. If any of it interests you, please feel free to borrow! Backboards are generally very important to micro layouts, because they help to set the scene and create a feeling of space. I was looking for a really inexpensive background source for the PPRR, and happened across Elfin Models on the Internet. 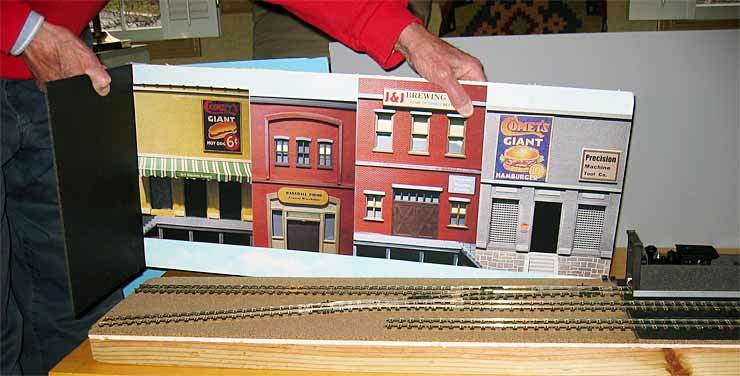 They make really excellent background buildings for O scale — and even better, they provide excellent photographs of their standard designs! I shamelessly borrowed their photos, rescaled them in PhotoShop Elements to O scale size, printed them using my computer, and pasted them side by side on a piece of foamcore to form an O scale urban backdrop. In this photo, I’m putting the backdrop in place, along with the lefthand end piece, which is just a plain square of black foamcore cut to size. On my version of the pike, the backdrop is 27 inches long. Next, I borrowed a trick from the theatre and built a “tormentor” — a projecting, flat “wing” that sticks out from the sidelines and blocks the audience’s view of part of the stage … in this case, it blocks their view of the two rear tracks exiting into the Fiddle Yard. The left side of the Cooperage flat is pasted on the tormentor, making this bit of fakery an important part of the scenery! An end-loading platform is planned for the front siding, to serve the Cooperage (see plan above). The exit of the front siding will be hidden by the proscenium arch. The final piece of the “staging” for this set comes next (below) as we place a frame across the front of the stage (usually called a proscenium arch). The frame has parallel strips of foamcore behind it that create a press fit for the two end boards that hold it in place. One small piece of masking tape is helpful, at the upper right rear corner, to keep the whole thing solid and stable. As far as rolling stock is concerned, everyone’s desires will be different. To duplicate what I’ve shown in the photo above (which just happened to be stuff I had on the shelf — I haven’t made up my mind about stock for this line yet) would cost $45 for the Bachmann Porter loco, and $37 for a box of three V-skips. Your needs and wants will undoubtedly be different! But you can be running your own micro layout for about three evenings of work and an investment of less than $150 total. Install ground cover – grass, weeds, bushes, shrubs, junk, etc. Here’s wishing you a lot of fun with your first micro. Next installment: How to operate Peek’s Pike. Stay tuned!